That’s what the report recently released by PriceWaterhouseCoopers (PWC) has to say – This is significant finding given that Goldman Sach’s in its earlier “BRIC report” had projected India to surpass Japan only by 2032. 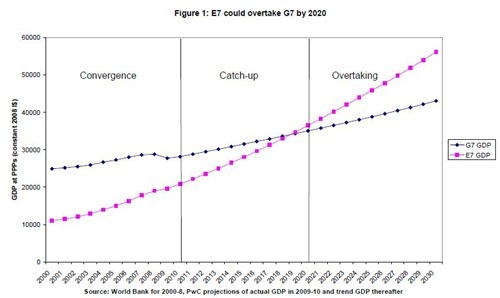 The PWC report pulls back by nearly 20 years, which in itself is quite huge. This is due both to India have a significantly younger and faster growing population than China and due to it having more ‘catch-up’ potential due to starting from aÂ lower level of economic development than China at present. However, India will only fully realize this potential if it continues over the next two decades to pursue the growth-friendly economic policies of the last two decades. One of the key things that we need to consider is also that, during recession, nearly all developed countries showed flat to negative growth, Whereas countries like India and China clocked more than 6% growth. 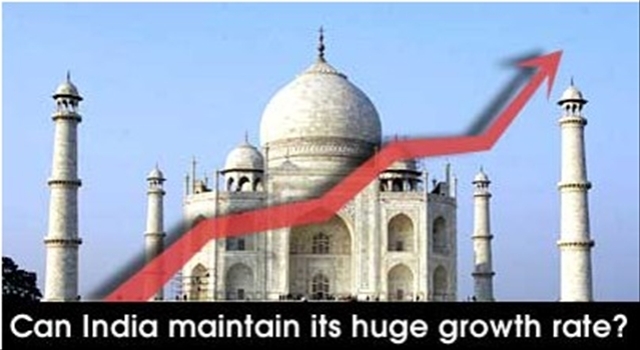 Like the report pointed out, it is also important that Indian Economic Policies are growth oriented, which are completely dependent on how stable is the Government at the centre. If we have good pro-reformist government for most part this decade, I am quite confident that we can easily achieve close to double-digit growth through-out. Its not only India, but Emerging Economies E7 (China, India, Brazil, Russia, Mexico, Indonesia and Turkey) will overtake the current 7 developed economies G7 (US, Japan, Germany, UK, France, Italy and Canada). We will see a world very different post 2020 then what we are seeing now ! India is also likely to become less dependent on outsourcing and more on manufacturing exports, building on is strong engineering skills and rising levels of education in the general population over the next decade. Consumer markets in major Indian cities will also become increasingly attractive to international companies as the size of the middle class there grows rapidly over time. Its lucky that are part of this Era and living through this Indian rise ! Quality Control Of Products In India: Is It Up To The Mark? India will shine in coming future…. coming from 12th to 3rd in few years is not a big achievement because total population of 3rd to 11th should be much less than population of india alone. Few of the nations overtaken by india are smaller than indian cities, few are on the peak of their development. We need a much faster and quality growth percolating to grass root level. Iwill like that india takes SAARC along with her and SAARC becomes no1 or no 2 economy by 2020 in total gdp terms. two things puzzel me 1. saarc being tropical area is rich in solar thermal energy it is free and infinite. A 4 pot box type solar cooker of Rs. 1862 can save 30 to 40 lpg cylinders at Rs 50 per cylinder about 15 times cheaper than LPG. than why we are not using same . India alone can save rs 270OOO crore on cooking and water heating alone as compared to LPG cost by using solar passive thermal energy. SAARC have got most furtile land most laborious and infinite farmers along with ample rain and river water india gets 4 times more water tahn her needs and bangladesh and nepal are even more rich in water resources.water and solar thermal energy can be only used after removing toataly mnmindful LPG and water subsidy. Cooperation in SAARC will remove the obstacles of terrorism , naxalism, narrow mindedness of states and fatal defance expenditure. we can even achieve 20 to 30 % growth rate as we at rock bottom of development and usa is at it’s peak. USAhas to go down in any case anse and SAARC has to go up if there is peace. for example my uncle in N.J. USA takes bath in a personal heated swimming pool while i and probably Sachin can only use one bucket, though both me and my uncle raju are radiologists. THANK YOU for hosting such a professional blog.KEEP IT UP AND WISH YOU SUCCESS. The third place jump is in PPP and not in nominal rate. The nominal rate change is from 12th position to 8th in 2012-13. This is not based on nominal rate but on Purchasing Power Parity ! But the Goldman Sachs prediction was for GDP nominal. Heck even China is below Japan in GDP nominal. Its almost like impossible to move from the 12th place to the 3rd place in just 2 years, but their are chances if developed economies move down. Even if India does become an export driven economy, the fall of other countries would definitely effect India, so it has to be done in such a way that Indian goods become of high demand elsewhere, this will cause a drain of wealth in the US and some european countries.